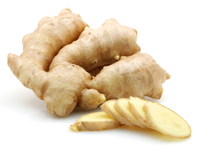 Ginger can help with glycemic control, insulin secretion and cataract protection. Ginger is the thick knotted underground stem (rhizome) of the plant Zingiber officinale that has been used for centuries in Asian cuisine and medicine. Native to Africa, India, China, Australia and Jamaica, it is commonly used as a spice or flavouring agent in cooking, as an alternative ‘herbal’ treatment for various ailments such as nausea and indigestion, and for fragrance in soaps and cosmetics. Ginger rhizome can be used fresh, dried and powdered, or as a juice or oil. It has a pungent and sharp aroma and adds a strong spicy flavour to food and drink. A study published in the August 2012 edition of the natural product journal Planta Medica suggested that ginger may improve long-term blood sugar control for people with type 2 diabetes. Researchers from the University of Sydney, Australia, found that extracts from Buderim Ginger (Australian grown ginger) rich in gingerols – the major active component of ginger rhizome – can increase uptake of glucose into muscle cells without using insulin, and may therefore assist in the management of high blood sugar levels. In the December 2009 issue of the European Journal of Pharmacology, researchers reported that two different ginger extracts, spissum and an oily extract, interact with serotonin receptors to reveres their effect on insulin secretion. Treatment with the extracts led to a 35 per cent drop in blood glucose levels and a 10 per cent increase in plasma insulin levels. A study published in the August 2010 edition of Molecular Vision revealed that a small daily dose of ginger helped delay the onset and progression of cataracts – one of the sight-related complications of long-term diabetes – in diabetic rats. It’s also worth noting that ginger has a very low glycemic index (GI). Low GI foods break down slowly to form glucose and therefore do not trigger a spike in blood sugar levels as high GI foods do. Ginger has been used as an herbal therapy in Chinese, Indian, and Arabic medicine for centuries to aid digestion, combat the common cold and relieve pain. Its powerful anti-inflammatory substances, gingerols, make it an effective pain reliever and it is commonly used to reduce pain and swelling in patients with arthritis and those suffering from other inflammation and muscle complaints. In fact, ginger is said to be just as effective as nonsteroidal anti-inflammatory drugs, but without the gastro-intestinal side effects.